Statoil, together with partners Petoro AS, Det norske oljeselskap ASA and Lundin Norway AS, has drilled the Aldous Major North prospect (PL 265) in the North Sea. Samples taken from well 16/2-9S, drilled by the rig Transocean Leader, have proved a column of oil of up to 8 metres in formations dating from the Upper Jurassic period. Due to the limited reservoir quality, the partnership will consider further exploration drilling on Aldous Major North in order to clarify the structure’s potential. Well 16/2-9S was drilled some 12 kilometres north of the Aldous Major South oil discovery (16/2-8). Aldous Major North and Aldous Major South are two independent structures in the PL 265 licence and there was higher uncertainty related to well 16/2-9S in the northern part of the licence. “Statoil has previously communicated that the combined Aldous Major South and Avaldsnes discoveries may constitute an oil structure of between 500 and 1200 million barrels of recoverable oil equivalents, and we stand firm on this estimate,” says Gro G. Haatvedt, Statoil’s senior vice president for exploration on the Norwegian continental shelf. 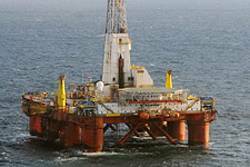 Following completion of well 16/2-9S on the Aldous Major North prospect, Transocean Leader will return to Aldous Major South to drill appraisal well 16/2-10. “An appraisal well on Aldous Major South demonstrates that we have great faith in the area’s potential and that the partnership would like to see speedy clarification of the total resource potential in order to secure the rapid development of this discovery,” says Haatvedt. Aldous Major North and Aldous Major South are located in production licence 265, where Statoil is operator (40%) along with partners Petoro (30%), Det norske oljeselskap (20%) and Lundin (10%).